Recently, a group of industrially produced chemicals have been detected in waters throughout the State of Michigan and across the nation. These chemicals are collectively known as PFAS, an acronym standing for per- and poly-fluoroalkyl substances. In chemistry terms, this means the chemicals are made of chains of carbon atoms connected in various ways to fluorine and other elements. PFAS represent a group of human made chemicals that have been used in a variety of industries in the United States since the 1940s and 1950s. The two most extensively produced and studied PFAS compounds are Perfluorooctanoic Acid (PFOA) and Perfluorooctane Sulfonate (PFOS). ​Click on the plus sign to reveal answer for each question. The primary exposure of concern is through drinking water and ingestion. Dermal contact is not deemed a significant risk at this time. Eating fish caught from water contaminated by PFAS (PFOS, in particular) can be an exposure pathway. 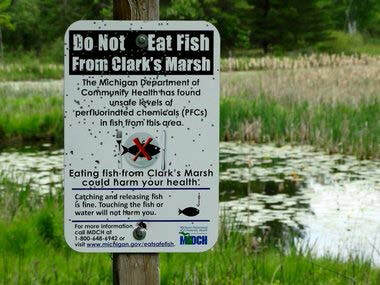 Fish are being collected from local lakes and rivers and tested for some of the PFAS chemicals. 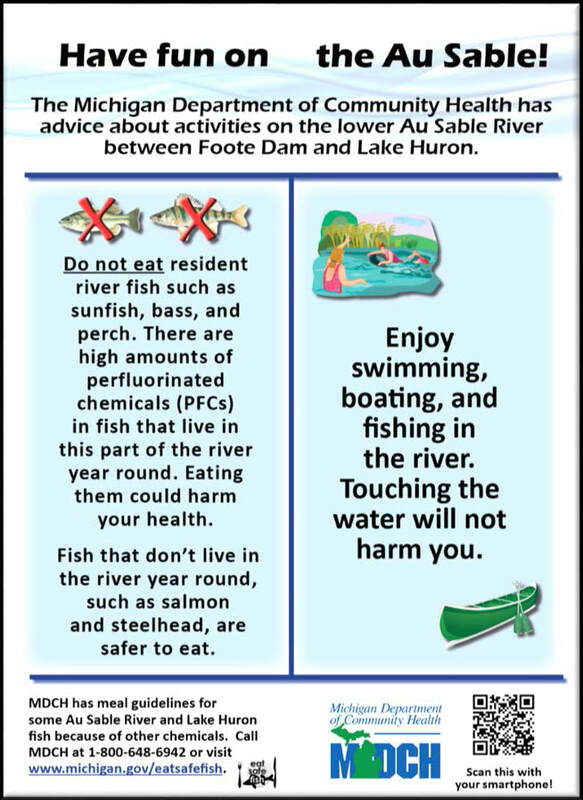 Michigan Department of Human and Health Services releases Eat Safe Fish Guides each spring, and emergency advisories as needed. In water bodies with fish that have a PFOS guideline, touching the fish or water and swimming are not considered a health concern as PFAS do not move easily through the skin. An occasional swallow of river or lake water is also not considered a health concern. Click here for Consumption Guidelines for Fish with Elevated PFOS Levels. In addition, in October 2018, the Michigan Department of Health and Human Services (MDHHS) issued a ‘Do Not Eat’ advisory for deer taken within approximately five miles of Clark’s Marsh in Oscoda Township. The advisory is due to high levels of PFOS found in a single deer taken about two miles from Clark’s Marsh, which borders the former Wurtsmith Air Force Base that has known levels of high contamination. As of January 2019, no other advisories on eating deer at any of the other locations tested for PFAS exist in Michigan. The State is actively sampling in other locations to determine if there is the potential for similar situations. People can also be exposed to PFAS chemicals if they are released during normal use, biodegradation, or disposal of consumer products that contain PFAS. As a result, the average person has been exposed to some level of PFAS during their lifetime. However, having PFAS in your blood does not necessarily mean that you will become ill from PFAS. 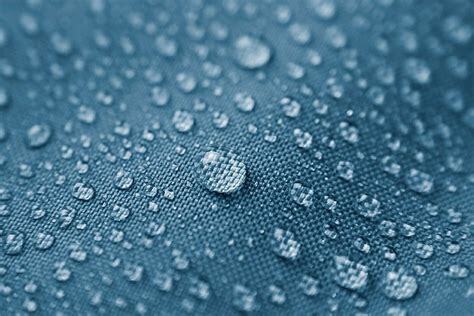 ​Are PFAS still used today? The U.S. Environmental Protection Agency (EPA) is particularly concerned about the long-chain PFAS chemicals. Studies on shorter chain chemicals suggest they are less bioaccumulative and less toxic than the long-chain PFAS. Industry has collaborated with the EPA to undertake several voluntary phase-outs of the long-chain chemicals. There are a limited number of ongoing uses of the long-chain chemicals still available in existing stocks and from companies not participating in the PFOA phase-out program. In addition, exposure could occur via goods imported from countries where PFOS and PFOA are still used. Furthermore, alternatives are polyfluoroalkyl substances with shorter fluoroalkyl chains than C8, which have not yet been proven to be any safer. The U.S. Food and Drug Administration (FDA) directed food companies to stop the use of PFAS with chain lengths of eight or more carbons (a specific group of PFAS that includes PFOS and PFOA) for paper and paperboard food contact materials in 2010. This includes fast-food wrappers, to-go boxes, microwave popcorn bags, and pizza boxes. Some other PFAS chemicals are still allowed for these materials, however, the FDA regulates and limits the amount manufacturers can use and for what specific purposes. ​Why are we concerned about PFAS? PFAS bioaccumulate and are incredibly persistent in the environment. This means the amount of PFAS that build up in organisms and in ecosystems over time do not break down in the soil or water environment. Some evidence exists for adverse health effects, such as higher risk of various cancers, liver/kidney abnormalities, impacts on the immune system, and thyroid conditions. However, these are not completely understood and research continues to be conducted to understand how the timing, duration, and concentrations of exposure play a role on the effects of PFAS. Currently, the EPA’s recommended lifetime health advisory limit is set at 70 parts per trillion (ppt) for PFOA and PFOS (the two best studied PFAS compounds). Currently, the EPA has not set health advisory levels for the other PFAS chemicals. Michigan has adopted a clean up standard for contaminated groundwater supplies of 70 ppt for PFOS and PFOA, based on the EPA standard. ​However, this number may be too high. A recent draft study by the Centers for Disease Control and Prevention (CDC) found that, for certain PFAS, health issues began presenting themselves at signiﬁcantly lower levels than the current EPA recommendation of 70 ppt. The Association of Drinking Water Administrators expects these study results will lower the recommended safe level to 7 ppt for PFOS and 11 ppt for PFOA, seven to ten times lower than the EPA’s current recommendation. What is the State of Michigan doing about PFAS? 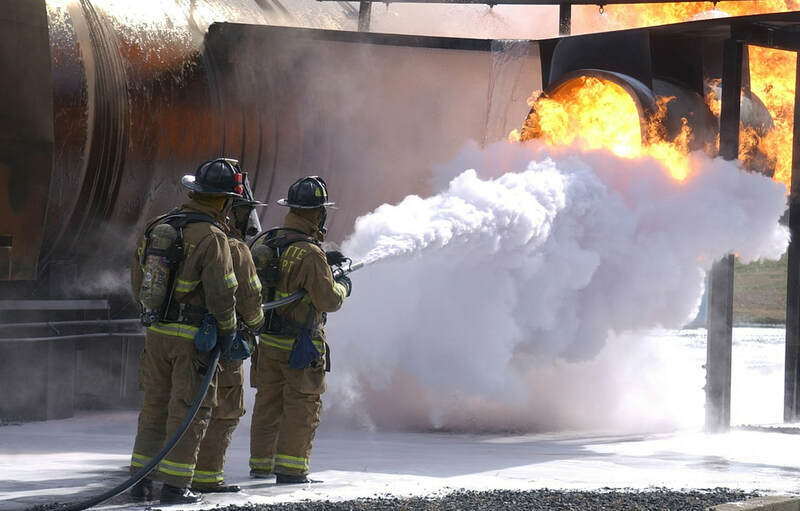 The State of Michigan is taking a proactive approach in identifying areas with PFAS contamination. The State established the Michigan PFAS Action Response Team (MPART) for a rapid and multidepartmental response. MPART is requiring all public water systems and 461 schools to test their water supplies and have asked wastewater treatment plants to test their discharge. Furthermore, Michigan is getting its labs ready for PFAS testing, helping to reduce the time it takes to get back certified results. They are also testing different fish and recommending limited or no consumption of certain species due to PFAS contamination. All this information is available to the public on the Michigan PFAS Response website. Do we need to be concerned about PFAS contamination in Northern Michigan? Currently, the status of PFAS in the waters of our service area is relatively unknown. Public drinking water systems are being tested across the State, with Emmet, Charlevoix, Antrim, and Cheboygan County’s systems tested in August of 2018. Results for Antrim, Cheboygan, and Emmet County show no detectable levels of PFAS. The City of Charlevoix tested positive for PFAS, with levels of PFOA and PFOS between 2-4 parts per trillion (ppt). The Walloon Lake Water System in Charlevoix County had non-detectable levels of PFOA and PFOS, but showed ranges between 2-19 ppt for other tested PFAS. The EPA has not set health advisory levels for the other PFAS compounds. Boyne Falls Public School tested positive for 7 ppt for PFOA and PFOS combined, well below the EPA lifetime health advisory level of 70 ppt. However, this is only for communal drinking water systems. Data for lakes, rivers, and individual wells are very limited. How can I reduce potential exposure to PFAS in my drinking water? There are some treatment options available for residents who are concerned about their drinking water. 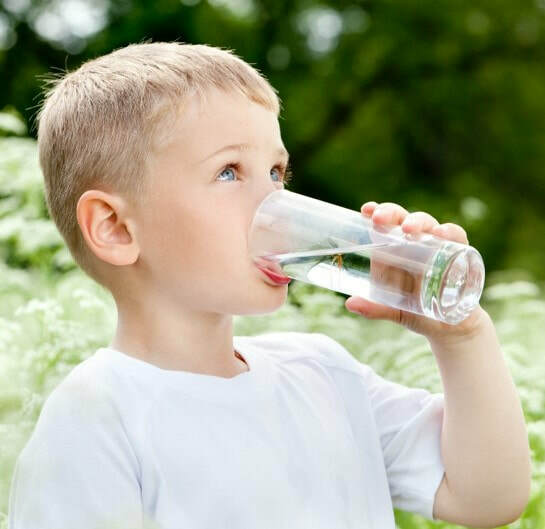 In-home water ﬁltration systems are recommended by the Michigan Department of Health and Human Services to lower the levels of PFAS in drinking water. Both granular activated carbon (GAC) and reverse osmosis (RO) ﬁlters can reduce PFAS substances. An NSF P473 approved ﬁlter should be used. Filters must be selected, operated, and maintained to manufacturer’s speciﬁcations. How do I know if my community water supply is at risk? Contact your local water supplier and ask for information on PFOA and PFOS in their drinking water and request a copy of their Consumer Conﬁdence Report. Who do I call if I am on a private well and concerned about ​PFAS in my drinking water? The State of Michigan Environmental Assistance Center can be contacted at 800-662-9278. Representatives may be reached to assist with your questions Monday – Friday, 8:00 AM to 4:30 PM. Is the foam on my lake a sign of PFAS contamination? 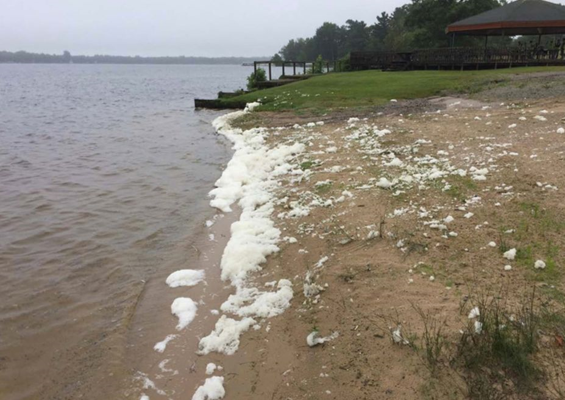 PFAS foam on Van Etten Lake in Oscoda Township near Wurtsmith Air Force Base. 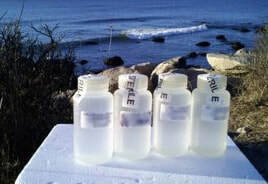 Some of the foam observed along shorelines of lakes and rivers are indicative of PFAS. However much of this foam observed is a natural phenomenon from the breakdown of organic material. Natural foam is usually persistent, especially during the fall season as leaves and other organic material enter nearby waters. Foam from natural decomposition is white and not slimy to the touch, as opposed to potential PFAS related foam that has been described as whiter in coloration, frothy or effervescent in appearance, and slimy or sticky to the touch. What is the Watershed Council doing about PFAS? The Watershed Council is working with local governments and State agencies to research and test for PFAS in lakes and rivers throughout our four-County service area during 2019. ​We are also working with our partners at Michigan Environmental Council advocating for policy solutions to ensure there is a system in place to protect human health and the environment against PFAS and other emerging contaminants of concern. The policy solutions we are advocating for are listed below and address public health, transparency, cleanup, and accountability. Establish a drinking water standard for PFAS under the Michigan Safe Water Drinking Act by creating a Maximum Contaminant Level (MCL) for PFAS that uses the best science available. Based on a Center for Disease Control (CDC) draft study, this would indicate 7 ppt for PFOS and 11 ppt for PFOA, but this may change with more information. Ensure adequate revenue to address ongoing PFAS responses around the state. Ensure a sustainable funding source for contaminated site remediation. Michigan should lead a combined effort by the 50 States to marshal the needed political forces to make the federal government, especially the Department of Defense, fund cleanup and remediation. Change our laws so that they hold not only the party who caused the release of chemicals responsible, but also include any company that is aware of the dangers related to the chemicals it produces and sells but fails to disclose them to the public.